Lake Como is an extremely popular tourist destination in Northern Italy. With the views of the Alps as a backdrop, lots of upmarket resort towns with grand Villas, the opportunity to take a cruise along the water and some very trendy restaurants, it is a big draw for the rich and famous. 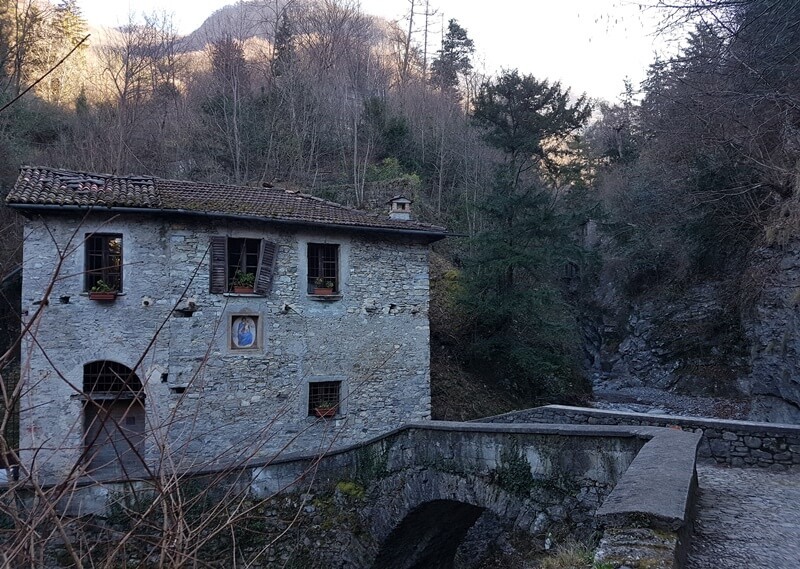 George Clooney buying a Villa in the town of Laglio drew even more people to the Lakes shores. For me though, unsurprisingly, it is all about enjoying the scenery from a quieter vantage point. 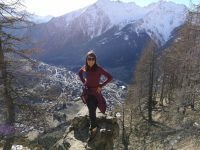 Hiking around Lake Como in the Winter may not be for everyone, but for me it is perfect. Yes, it is pretty chilly, there is often snow at this time of year, a lot of the restaurants, hotels and attractions are closed and there is less green on the trees. 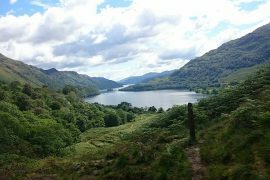 But the advantages are that the roads are so much quieter, a plus when they can be pretty narrow and windy, the temperatures make the hiking we do much more pleasant, especially for Annie Dog, and it often feels like we have the towns and villages that would be rammed in the summer all to ourselves. 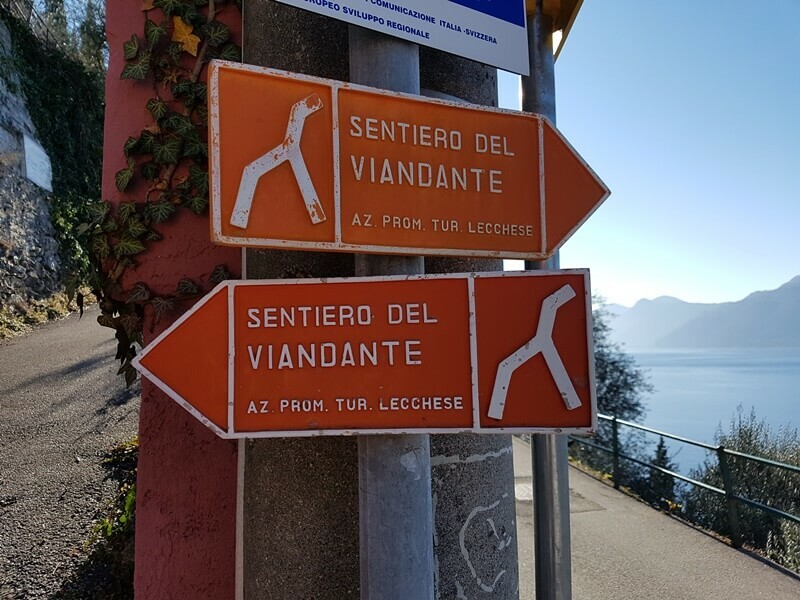 When we walked the Sentiero del Viandante from Varenna to Bellano we only met three other people and they were locals! When I say quiet, I really do mean it. 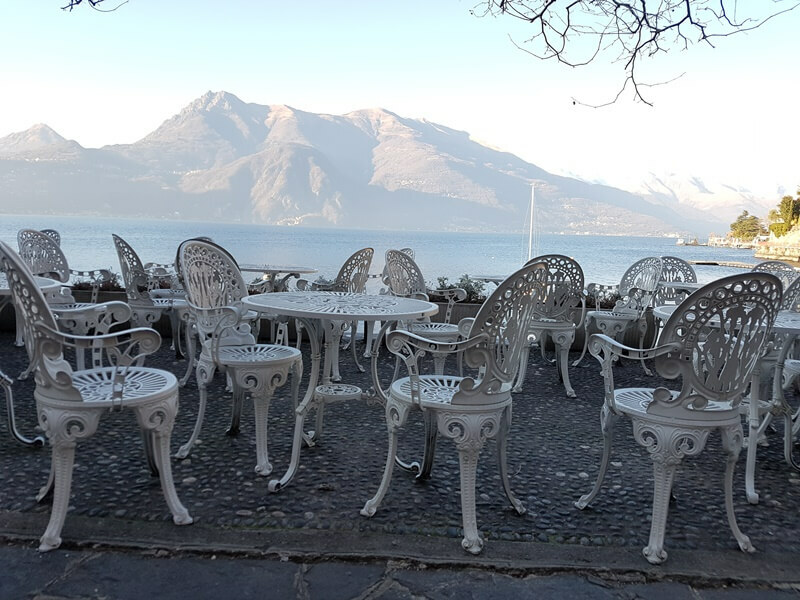 Popular spot in Varenna and not a soul around! 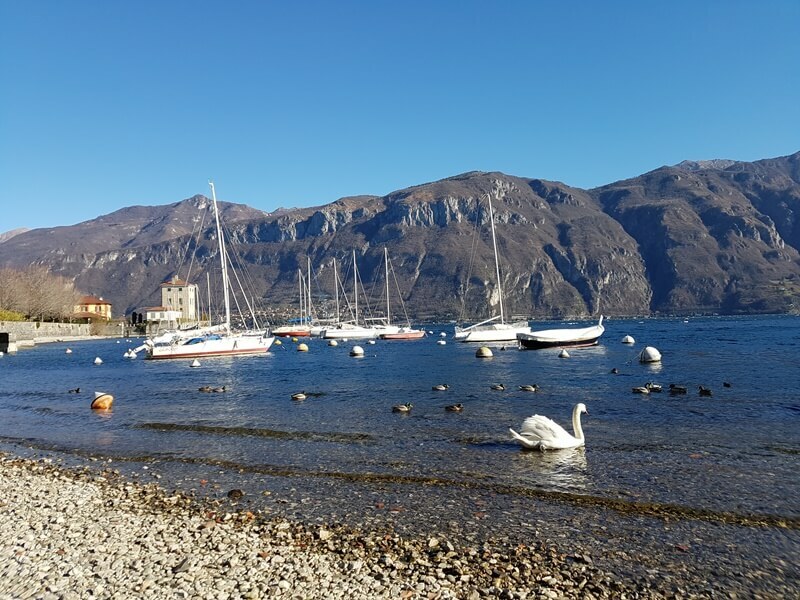 The City of Como itself is only around two and a half hours drive from Courmayeur so it is the perfect location for us to nip across for a few days. As I mentioned, there are fewer accommodation options to choose from at this time of year but those that are still open often have very good deals. 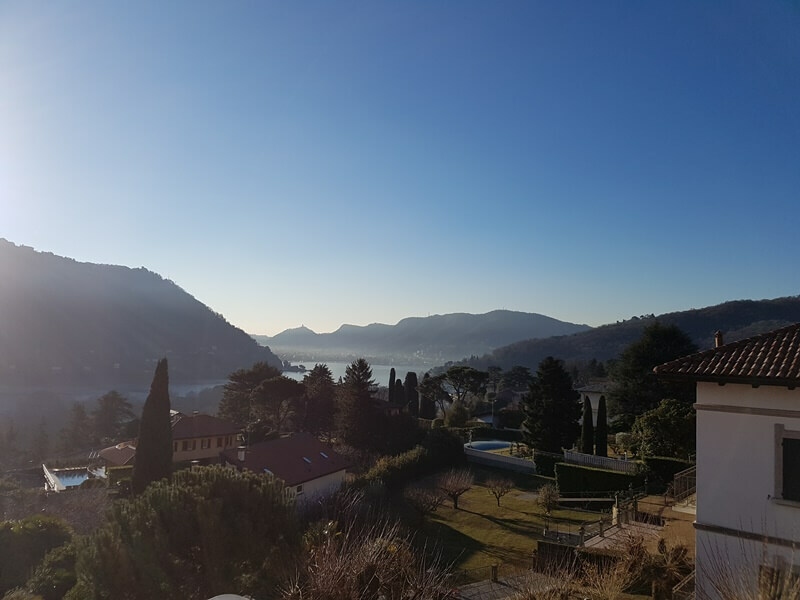 We choose to stay in Cernobbio, just five minutes drive from Como itself. We stayed at Hotel Asigno which was in an elevated position in a peaceful suburb with fantastic views over the lake. It is about a fifteen-minute walk down to the town proper, there is a cobbled lane you can follow to keep you off the roads. Like many hotels in areas with limited parking options they do charge 10 euros per day to use their designated secure parking but there is also free parking less than 100 meters along the road. There was plenty of space there for me but I am not sure what the situation would be like in the summer months. 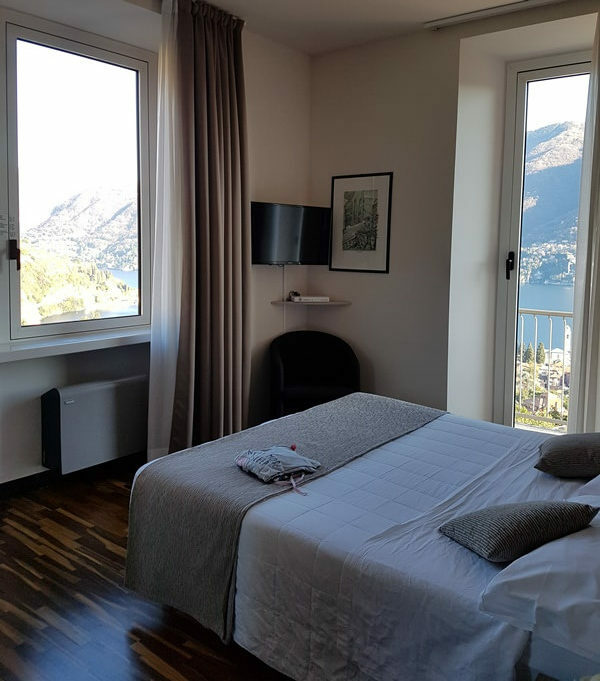 My room was spotlessly clean and had a little terrace which looks directly over Cernobbio onto the Lake, it was a bit too chilly to sit out but I left the curtains open so I could watch the sun come up from the comfort of my bed! The hotel restaurant was closed over winter so it was only breakfast that was provided. 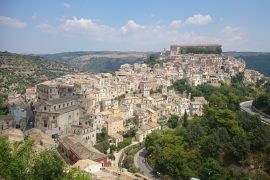 They very kindly recommended the nearby Albergo Ristorante Della Torre and it was very friendly and the food was delicious, I ate their two nights after having a disappointing meal down in the town centre on the day I arrived. 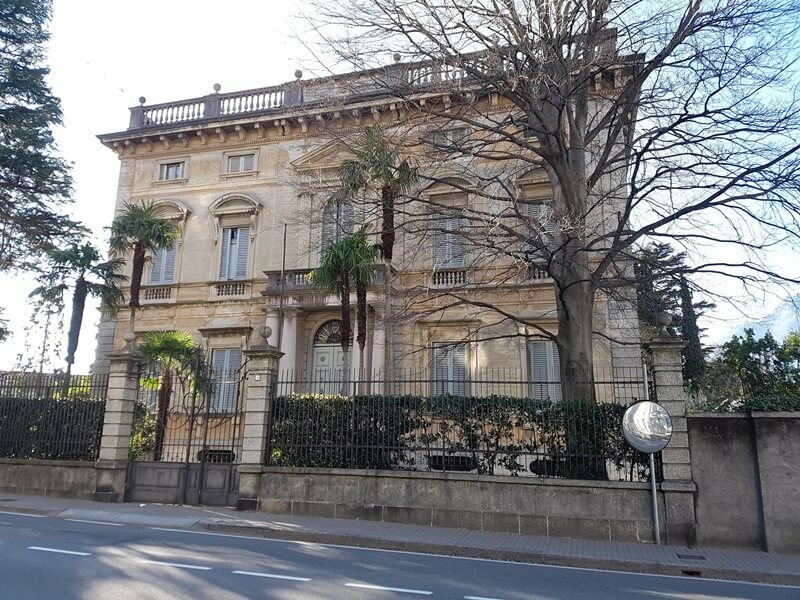 Cernobbio itself is perhaps best known for its grand Villas: Villa Bernasconi and Villa Erba but, for us, it was more of a central base to allow us to get out on some walks. It does also have a lovely promenade along the lakeside. There was hardly a soul there when Annie and I went for a wander on the day we arrived. 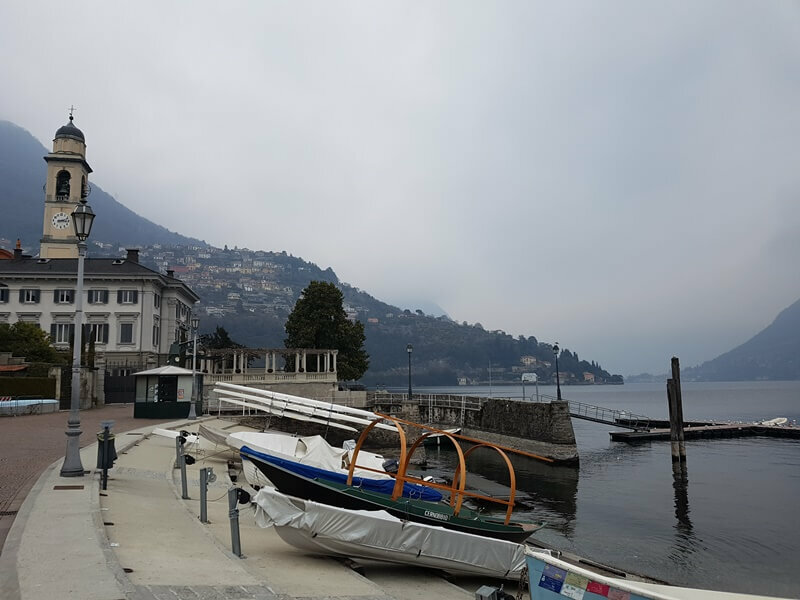 It is also possible to catch a boat to other popular towns on the lake from Cernobbio although the schedule is limited in the winter months. 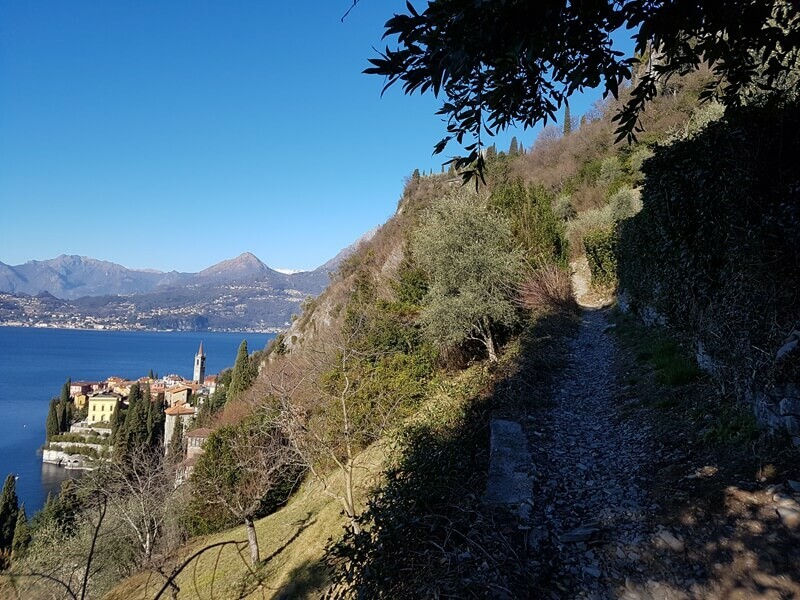 The Sentiero del Viandante is a 45-kilometre trail that runs along the east side of Lake Como from Abbadia Lariana to Piantedo. I would have like to walk the full trail but I wasn’t sure we would get the weather for it and so decided to opt for walking a section to see how we enjoyed it to start with. I hope to go back to do the full trail later in the Spring as Annie and I loved it. The trails are beautiful, taking you through terraced farmland, olive groves, sweet little hamlets and past some interesting ruins. 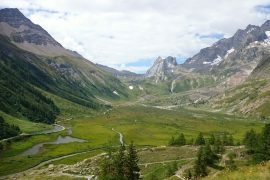 All the while, you have the views down to the Lake on your left-hand side. 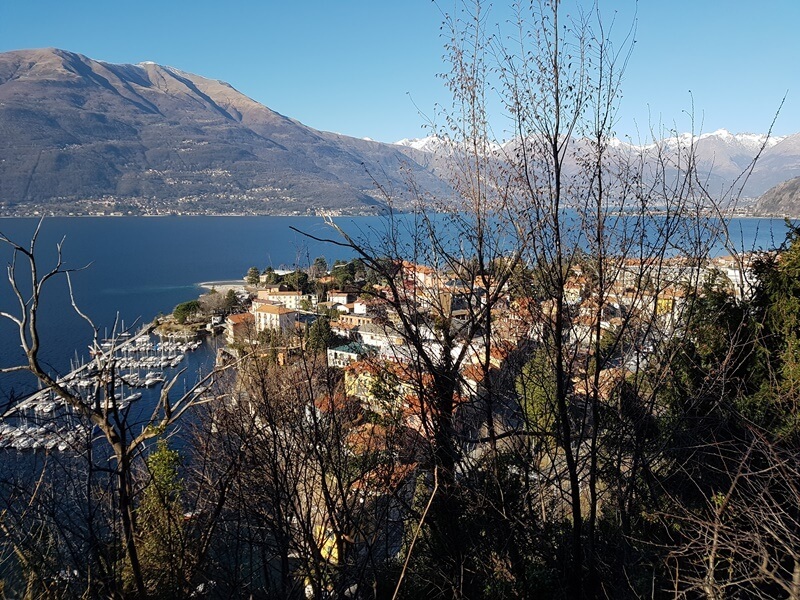 The section from the town of Varenna to Bellano is not too taxing and takes around 2 to 3 hours depending on your pace and stops for breaks to enjoy some of the sights along the way. I must confess that Annie and I got a bit lost so it did take us around 3 hours. There are good rail links along the whole route so it makes it easy to get back to your start point. Despite the orange Sentiero del Viandante signs, I did still manage to get a little lost! 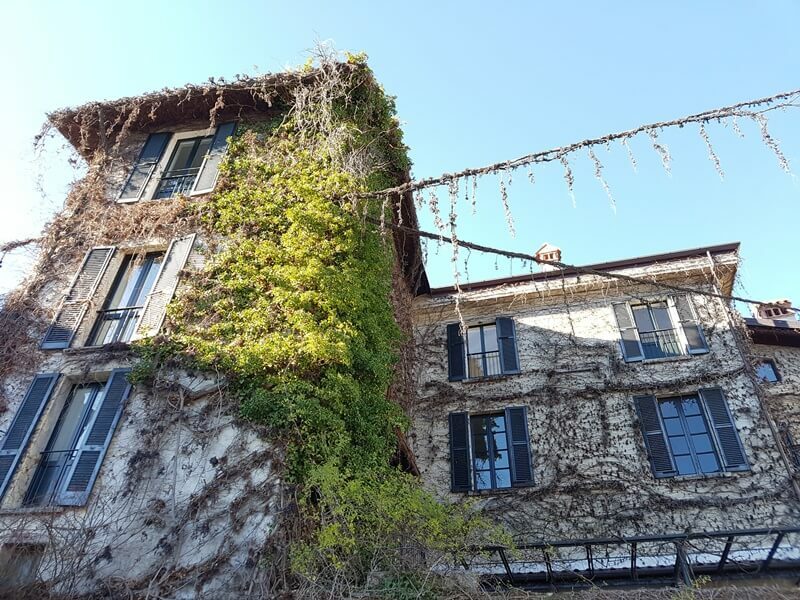 I parked on the outskirts of Varenna in some free parking spots just five minutes from the start of the trail. I imagine in the busier months they may fill up quickly and you may have to resort to the paid parking available beside the train station. The initial walk up is quite steep. 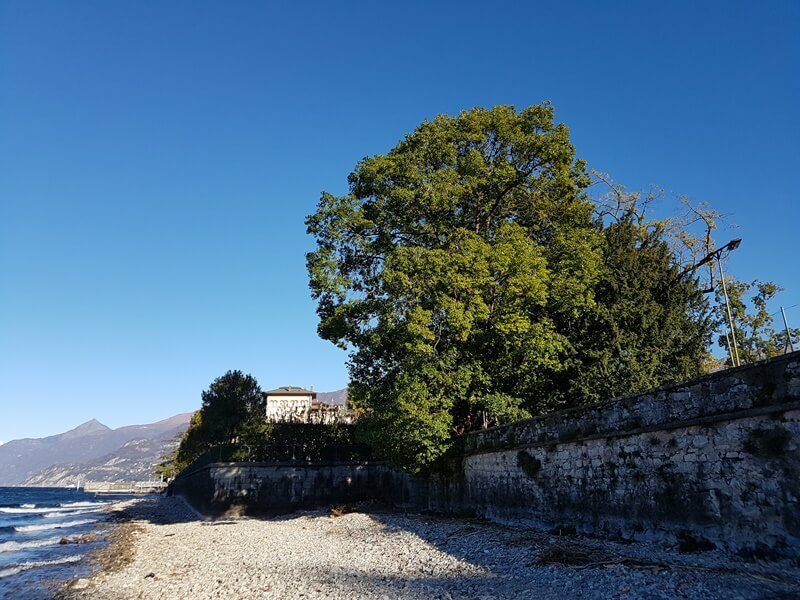 You are looking for signs for the Castello Di Vezio which is the first landmark that you will come to. The Castle is open to visitors but do check before you arrive as it is closed at certain times of year (like when we visited) and has limited opening hours at other times. If like me, you are walking with your dog you will not be able to enter the Castle anyway as they are not allowed in the grounds. The trail is well signposted up to the small village of Perledo. There are plenty of orange signs marking the trail paths and it points you in the direction of Bellano up to this point. Yes, I am probably a muppet but on reaching Perledo I got a bit lost. There seemed to be orange signs pointing in all sorts of directions and there were arrows indicating paths heading to every destination except for Bellano. After asking a local she very patiently and kindly pointed me in the right direction. If you follow the road up to the left which is in front of the local Bar and Tabbachi and you go past a Cemetery you will find your way back onto the correct trail along the coastline. There is a very short stretch here where you have to walk along the roadside but it is only for about ten minutes and then you are back onto the mule trails. On reaching Bellano I had wanted to visit the Orrido (gorge). It is one that you do have to pay to access the path but I had read that it was worth it. Unfortunately, it was closed when we visited but it may be worth adding this onto your walk if you are not too tired. Annie then experienced her first train journey from Bellano back to Varenna. Tickets are purchased in the little cafe in the Station and the fare was just €1.40 for the 10 or so minute journey. 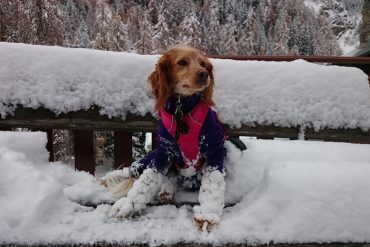 If you are travelling with a dog, you do have to purchase a ticket for them if they are not small enough to fit in a carrier that can go on your knee. I had been advised that normally it is half the fare of a normal passenger but Annie paid the same as me. 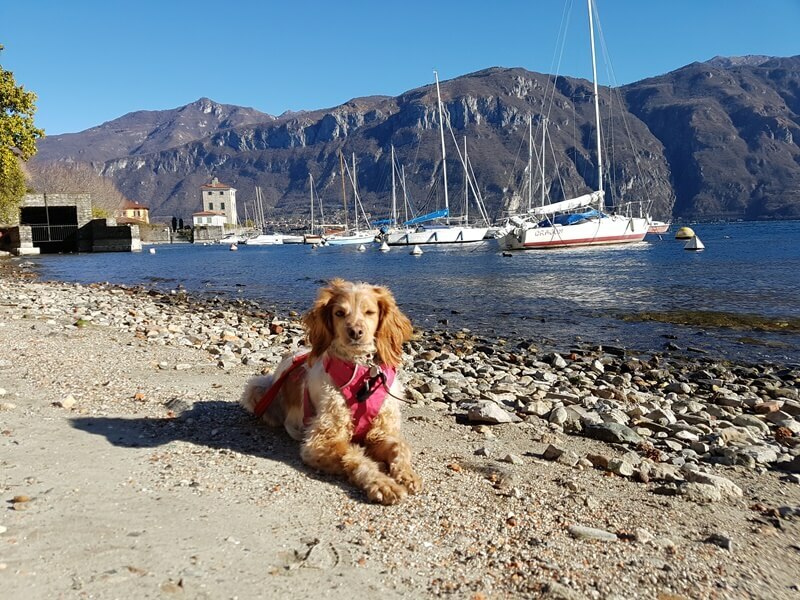 When we arrived back in Varenna we took the time to explore down by the lakeside. It is a really beautiful town. During the summer there are a number of lovely gardens and Villas that you can also take the time to explore. Annie and I just enjoyed the tranquillity of the town at this time of year. Apart from a couple of locals, there was not a soul in the pretty Piazza. 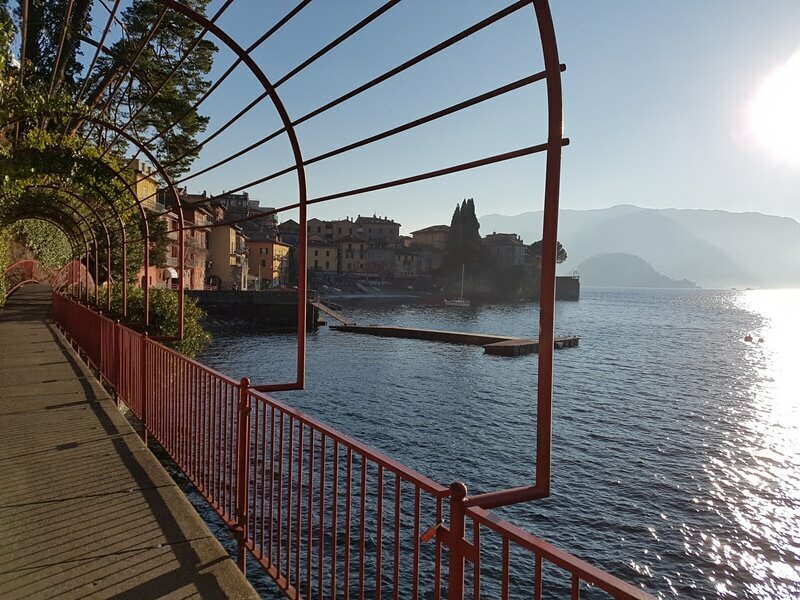 Bellagio is, in the Summer, a much-visited village that is famed for its beautiful cobbled lanes, high-end restaurants and impressive buildings including Villa Serbelloni and Villa Melzi and their gardens. When I first arrived, whilst it is, of course, beautiful, I must confess to being a little underwhelmed. 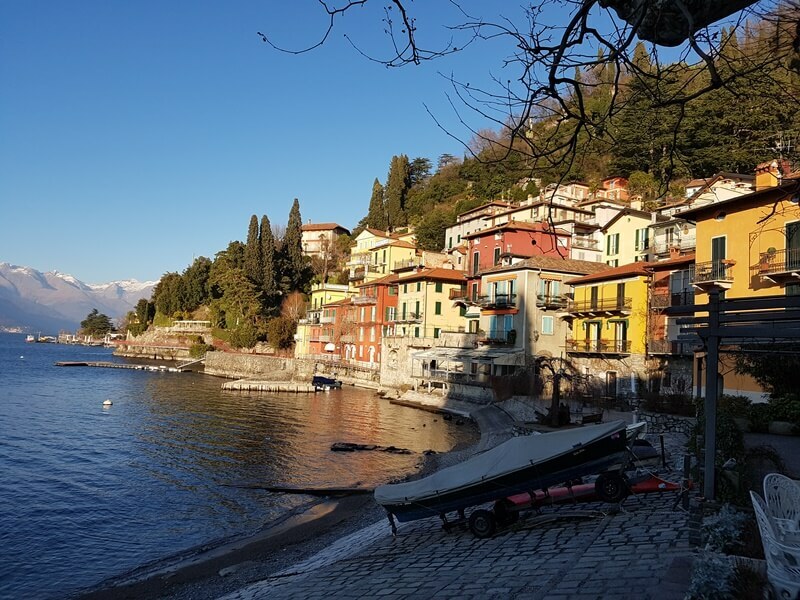 I preferred the feel of Varenna, there is a longer and more characterful area along the side of the water to explore. I can imagine that in the summer months it will be extremely busy and very geared up for the tourist throngs. I decided to explore further and I was so glad that I did. After coming away from the Piazza at the top of the village on the right-hand side there is an exit onto a lane that leads down to the adorable little village of Pescallo. Follow some high walled, cobbled narrow alleys down towards the water’s edge and you are in for a real treat. A totally tranquil space that retains the traditional fishing village feel. 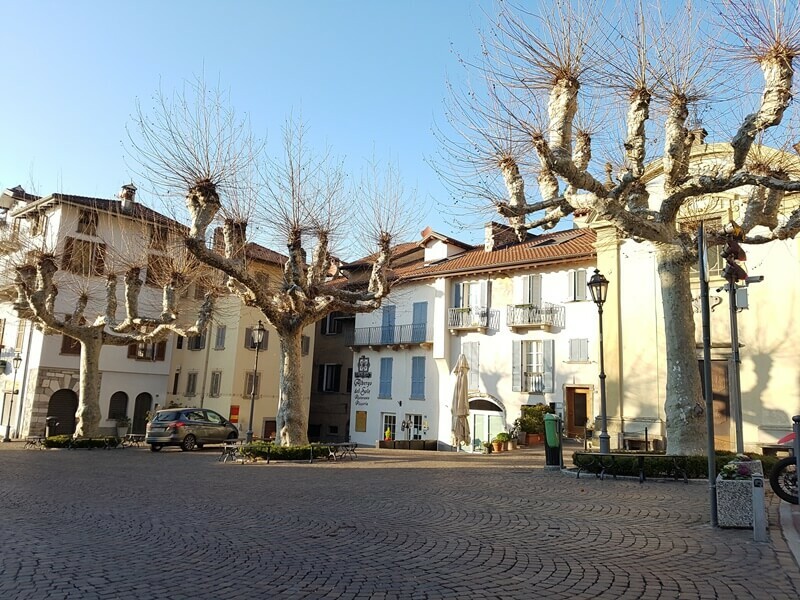 Pescallo itself is full of characterful old houses and a few very grand villas. The Bay is extremely peaceful, a real sun trap and has wonderful views across the Lake. I was really enchanted and Annie and I took some time to just sit and relax, soak up some sun and enjoy the outlook. 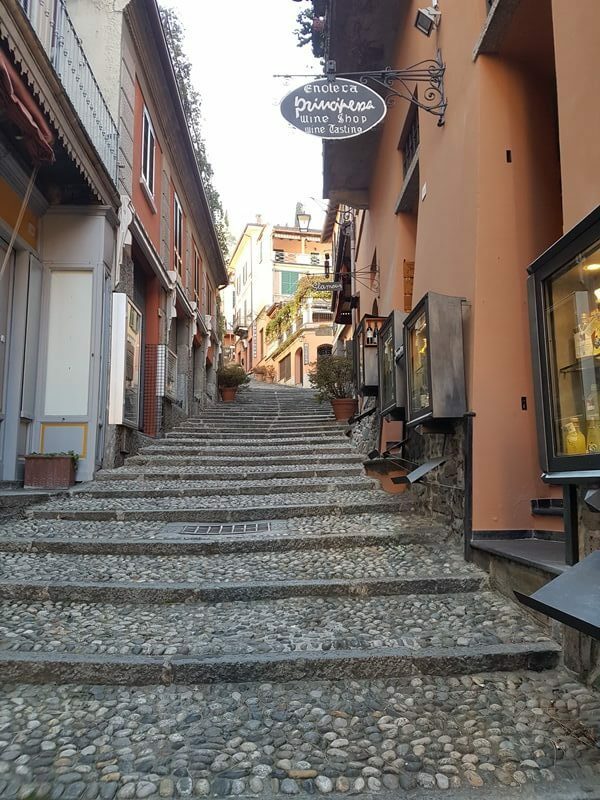 Rather than walking back the way we came, we headed left after the bay and enjoyed a wander through some of the residential suburbs of Bellagio. Have you watched the fabulous documentary series ‘Dogs’ on Netflix? Even if you are not a dog lover like I am, I would highly recommend it. Each episode is beautifully and thoughtfully shot. It is a wonderful study of different lifestyles, cultures and family and friend bonds. The episode ‘Ice on Water’ is an utter delight. 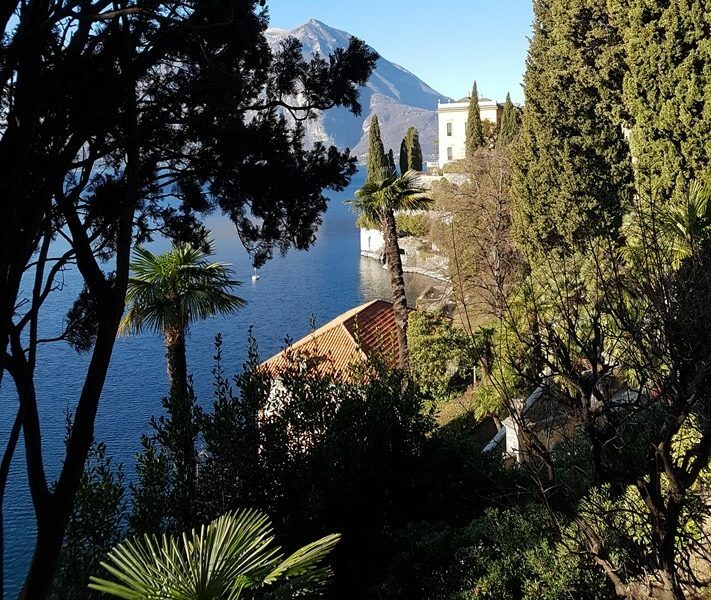 Following a family that has lived and worked in the traditional, sleepy fishing village San Giovanni, just ten minutes drive from Bellagio, along with their much loved Labrador Ice. The episode has given a boost to the economy of the Village with lots of new visitors looking to visit the families little restaurant. When I visited, there was a Swedish family that were staying in the Village purely because of watching the episode! They were actually the only other people that I met when I was visiting though. In the winter everything is closed so it is all about just enjoying exploring the tranquil village and it’s shoreline. We enjoyed a stroll through the cobbled streets, there are some really quirky buildings to appreciate. 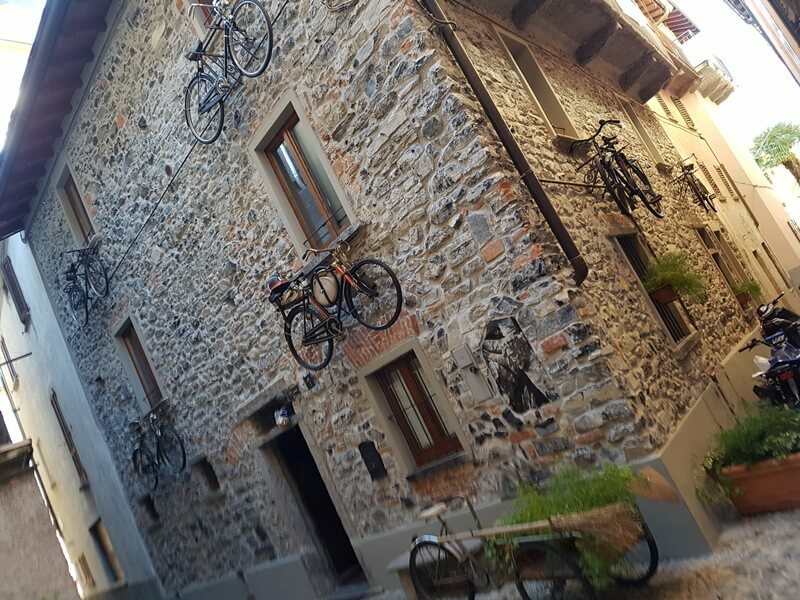 A traditional old house in San Giovanni adorned with bikes! The little harbour is equally bewitching. I also took a wander along the lanes leading to some extremely grand villas and found a little pebbled bay that we were able to do some beachcombing on and I found some unusual pieces of very old tiles hidden hidden amongst the pebbles. Even if you don’t have the privilege of meeting Ice, it is a worthwhile stop off. It ended our day perfectly!